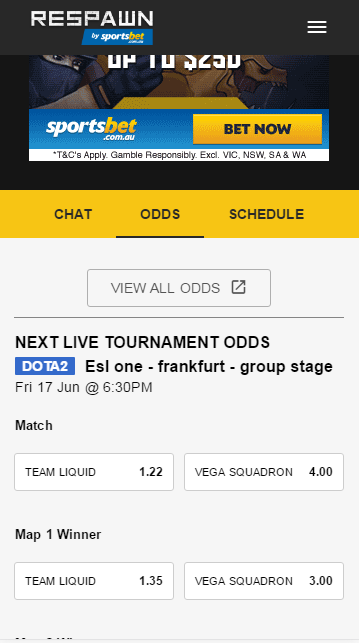 Respawn is a live streaming service, We've partnered with ESL to stream tournament matches, all you need is a Sportsbet Account. If you already have an account, you can use your existing login details. You can also register for a Sportsbet account on the Respawn login page. We offer eSports Markets across the most popular games. 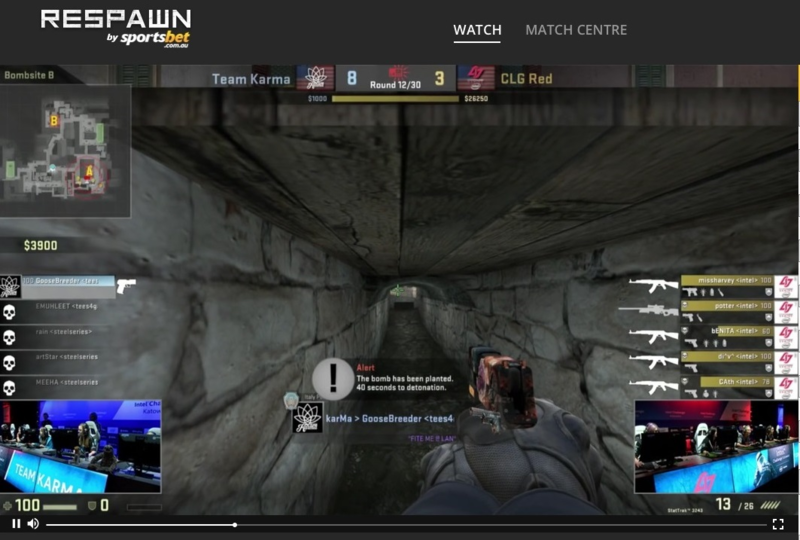 You can also view live streams of ESL Tournament games via our Respawn site. We will be streaming top-tier ESL eSports tournaments from all around the globe, including: Dota 2, Counter-Strike: Global Offensive, League of Legends, Starcraft 2 and Heroes of the Storm. How do I access Respawn? 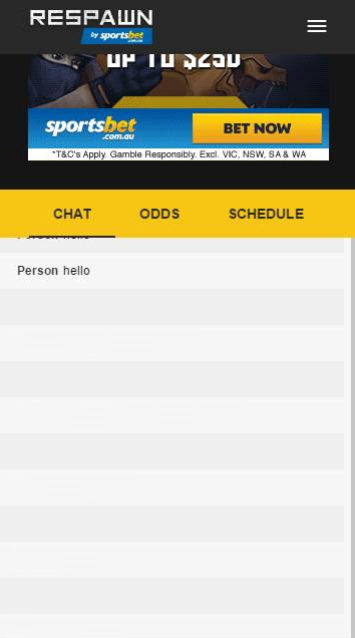 Login to Respawn using your Sportsbet account details. If you do not have an account, you can register for a Sportsbet account directly on Respawn. You will then be prompted to enter your chat name. You can use any name you like, as long as it's appropriate (it is purely used for Chat is seperate from your account name for privacy purposes). It's as simple as that! You are now ready to use Respawn. What can I do in Respawn? After logging in, you will be able to view stats, odds and view the current and upcoming streams, using the three main tabs (you can find them if you scroll down from the main page). You can watch the action whilst navigating through the tabs, so you won't miss out on any of the action! Participate in the action and contribute to the chat! 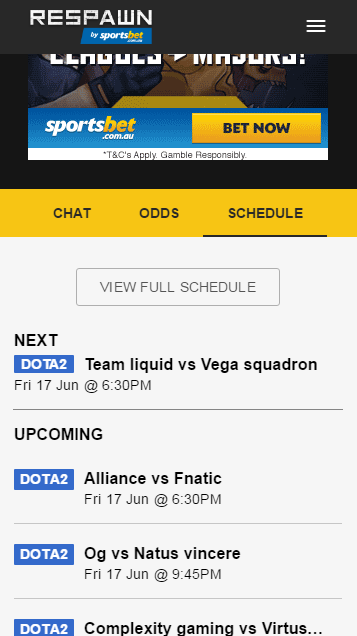 Where do I view Upcoming Matches? Respawn streams a range of games, you can expect to see all the big names such as: Dota 2, LoL and CS:GO, and more, as provided by our streaming partner, ESL. When do eSports Markets Open? eSports Markets open 24-48 Hours before a Match.